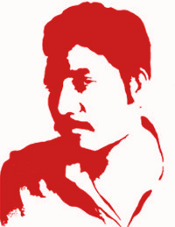 This comrade left his bright student life and cut relation with other party to join the East Bengal Workers Movement. His that role is appreciable. At the then situation of organization, it was more important to have theoretical knowledge to defeat revisionism theoretically and determine revolutionary line. That comrade got prominence at that time due to his theoretical knowledge. At the stage of applying theory and materializing political line, that comrade stood many material sufferings. He was in jail for many days and lived a hard life. Even in that situation, he was confident on party. At present also, he is standing difficulties. He has theoretical knowledge. Still he is confident on party. ▬ Once he forgot to keep contact with organization for several months. Party leadership himself found him out. ▬ He was given charge of an area and important papers of Revolutionary council to keep. He neglected both the works. The papers were very much dirty and unorganized. It took long time to recover those papers. ▬ Later, he was appointed in another region, but finally, he was appointed there in assistant post due to his disqualification in governing cadres, and comrade Taher was appointed as in-charge. That time, the comrade led arduous life, worked in rural areas and took part in Haru Babu annihilation. That time, he was got arrested, but he kept no such trace so we can understand the incidence of his being caught. So, organization thought he is disappeared. ▬ After 25 March (of 1971—CPMLM-BD), he went to India. He came to Payarabagan [A riverine forest area of Southern Bangladesh where the Proletarian Party of East Bengal first made Base Area in 1971 – CPMLM-BD] to make contact. When leadership was withdrawn from Payarabagan, that comrade was sent there to investigate situation and report to leadership as early as possible. Other than reporting via investigation, he transferred from Payarabagan with taking a troop to Patharghata of Mathbaria region. He established communication with leadership after about two months. Other than transferring to Patharghata of Mathbaria, if he had carried responsibility of investigation and report, it would be possible to resist the emergence of militarism of Tareq-Mujiv, setback of the troops of Front no. 1 and leadership could go to Front no. 1 to lead that. It would be possible for us to sustain the wonderful development that we had during the rainy seasonal strategic defensive of the Pak military fascists in Barisal district after their strategic offensive, and we could develop huge number of troops and liberate massive areas. The most surprising thing is that when he was going to Barisal for investigation, he found a friend on his way. Immediately, he wanted to go to Bagerhat with his friend to carry war. His companion comrade stopped him. ▬ Forgetting is one of his problems. He forgets many things very often. So, he cannot work and lead life in a disciplined manner. ▬ Many cadres, even sympathizers also knew the shelter of that comrade. In front of cadres and sympathizers, he would hire mini Taxi/Rickshaw by saying address of house in high voice, so, they came to know his shelter position. ▬ The Fazlu clique knew his shelter, and they made Kazi clique know that. After the conspiracy of Fazlu was revealed, party leadership transferred him to other place and repeatedly told him to change the shelter and not to stay at the previous one. Even later, leadership repeatedly told him not to stay at that house. But he neglected that word and order and stayed two moths more at that residence and took three or four comrades and papers in the same house; even he brought Stain, Revolver, ammunition and other materials there. At last, Police raided that house and arrested him along with another comrade. Arms, papers and house-materials were lost. Fortunately, one comrade could avoid arrest as he was outside and another comrade tactfully escaped. Thus, he violated the responsibility of security and word and order of high command and hampered the security of his own, comrades and the arms and materials of party. Though prohibited, the comrade made plan of himself taking part in economic operation. ▬ Leadership had informed him via letter that Fazlu clique should not be included in regional leading body and should be appointed in rural areas. He violated that order and gave Fazlu responsibility of an important city. As a result, Fazlu could carry conspiratorial activities in city that the comrade did not know. ▬ Later when activities of Fazlu clique were caught, Fazlu fled; later, Fazlu was found out. That comrade was ordered to confine Fazlu (So that he may not flee). But that comrade did not actualize that properly and emphatically. So, Fazlu clique could flee. As an end result of that, the clique could be able make their base in Khulna, seize arms and materials of party, deceive comrades, make works of Khulna suffer and carry anti-party activities for some days. If the Fazlu clique was guarded and confined at that very time, it would be smashed. If that comrade was cautious, Fazlu could be confined in his own shelter. (Fazlu with his wife used to stay in the shelter of the comrade). After the conspiracy of Fazlu was revealed, leadership sent that comrade to secretly go to his shelter and bring the Revolver that was kept there. The comrade seriously searched (Fazlu transferred that beforehand) but did not find. His activity raised doubt in the mind of Fazlu’s wife. The comrade asked her about the weapon and even, he forbade her to tell Fazlu about the weapon searching. As soon as Fazlu learned about everything from his wife, he along with her fled. Thus, because of the incautiousness of the comrade, they could flee from his shelter and was able to capture a weapon. ▬ Lenin called names of over simple and scoundrels at the same time because over simple persons may easily be used by scoundrels and unconsciously may help them and make losses to revolution. The conspirators too have tried to use that comrade, use him as their representative and put him forward as their puppet. That comrade reflected the opinions of clique, clique-affiliates and petit bourgeoisie, and unconsciously sometimes became their spokesperson. The aim of the clique was to put him as their puppet to call meeting of the so-called leading comrades, carry annihilation, rumor-slander, and terror and capture power at gunpoint. This is why the clique would not attack him and openly they said that they would be able to govern him. That comrade did not understand because he is over simple. Therefore, the Central Committee mentioned by criticizing him that some over simple comrade may be target of clique. That plan of clique was not actualized because of the cautiousness of party leadership. ▬ He kept a Stain for two months in house of certain sympathizer without his permission and without informing him. Later when the later knew about that he was very much terrified. ▬ He brought Stain to two sympathizers’ houses to show that we have Stain, which made them too much terrified. For these reasons, sympathizers of that region do not want party comrades know their residences. ▬ Previously also, he made such security violation. When he and several other comrades attempted to make explosive (Explosive should not be made in shelter or by leading cadres), accident occurred. He was shocked, so he could not bring valuable addresses, writings, diary and goods. He could smash papers there, but he did not do that. So, Police caught addresses from the diary and arrested one sympathizer who then suffered in jail for many days. ▬ That comrade when he was in jail, sent letters to many sympathizers by writing their names which made them feeling lack of security. Thus, their security was violated. ▬ He called one more comrades by their party names in high voice, when they came to see him. Thus, he violated their security. Lenin said, it is also a qualification of revolutionaries to avoid Police. For that, one needs to strictly abide by the security rules and make others to follow that. We see from the above-mentioned events that the comrade showed serious disqualification in following security of own, others and organization. Provided by center, there were six whole-timer cadres under that comrade. Among them, everyone excluding one could be utilized. Later, he made another one cadre whole-timer. Another one cadre was transferred from other region to under his guidance. That cadre could work whole time by staying at home. Thus, we see, including that comrade, eight cadres could work as whole-timer. He received at least three to four hundred Taka each month from higher level, while local collection was two to three hundred Taka. Area under his guidance, got second or third rank in whole organization in terms of money, cadre and other facilities. Yet, that comrade totally failed to utilize cadres and the above-mentioned facilities. Because of not distributing responsibilities and works, cadres were jobless. Consequently, two cadres (one whole-timer and the other was willing to work as whole-timer by staying at home) became opportunist. They were not given any work for two to three months, so they got frustration and became opportunist. One cadre left his work place and went to other region. He did not take responsibility from that cadre. So, work of that region was lost. Later, when new in-charge came, he/she saw that party cadres, by not having contact of party for long days, lost confidence on party. There was another important area that was under irregular communication. At last when he was arrested, he made promise twice but did not mention how to establish contact. Meeting of local leading cadres would not happen regularly but it happened only once in his whole work time. ▬ Centre sent pamphlet and documents to that region but neither he did reach those to cadres and sympathizers, nor made them read or distributed via them. He used to pile documents in bags and keep in his shelter. When he was arrested, Police got huge documents. We also got one bag full of documents that were not distributed. ▬ In his area, he never implemented the general work method of organization like organizing cadres, regularly taking class of them, teaching them security and secrecy, keeping communication, reaching papers and discussing on those, improving their standard, making new contacts via them, giving them responsibility and utilizing them etc. Consequently, cadres did not get developed and organized, rather, slowly, they left. So, local cadres never got development which was indispensable for the development of that area. Later, after good in-charge was appointed, local cadre came out (after guiding four months, four developed local cadres came out). Earlier, whole timer cadre was one, later it became four including two locals. Presently, the whole area is developing as a promising one. Because it is getting local cadres, basis of development of work is being prepared. ▬ That comrade, showed total failure in guiding sympathizers. When discussing and keeping contact with sympathizers, he used to go dirty and unorganized (cleanliness is the habit of proletariat, which he did not have. On the other side, he had dirtiness like the petit bourgeoisie anarchists). So, sympathizers felt uneasy and thought that their security was violated. He used to talk stereotype and whimsically with them. For that reason, many sympathizers did not think him smart. They even made such comment that if communication is maintained by him, sympathizers would leave (in fact, in many cases it happened), so, their quality was not improved. ▬ In carrying activities, he did not follow democratic methods like mobilizing cadres, collecting their views and taking their proposals. If others had given opinion, he would neglect that in many cases (in many cases like house changing etc.). He used to work whimsically. Consequently, work did not develop, cadres’ spirit has not developed and he himself got trapped in blind path. ▬ In some cases, he did not make open minded criticism and timely criticism. For that reason, once the Central Committee criticized him for not being open and not making timely criticism. ▬ His source of the above-mentioned errors is the outcome of not combining theory with practice because he knew those things theoretically but did not apply. Ideologically, it is manifestation of dogmatism. It is also manifestation of petit bourgeoisie ideology. That comrade, by not writing articles as summation of own experiences, wrote theoretical (not in light of own experience) articles. This is why he could neither learn from own errors to avoid future errors and nor he could regularly develop practice to higher level. Time and again he repeated the same error. It is dogmatic deviation. After knowing the above-mentioned things, it is natural for questions in the minds of the cadres to be created that why he is being given so much importance and opportunities when we brand the standard of the regional-in-charge as First Class and the next lower level cadres as Second Class and in fact his standard is lower than the two. Revolution and party cross through some stages. When our organization was in the first stage of revolution, at that time, the main task was to carry theoretical struggle against revisionists and determine revolutionary line. At that time, theoretical knowledge played the decisive role. Lenin said about that period, when revolutionary line has not been decided for making revolution, at that time, it is theory that becomes important to determine line. In our organization, during the time of struggle against various forms of revisionists and determining revolutionary line, comrades who have theoretical knowledge got prominence. That comrade also got prominence for that reason. During the Post 1971 period, the stage of determining line of organization was completed and the stage of actualizing line of organization became principal. But temporarily by December 1971, again line determining became principal for some time. But to give prominence to application, and on combining theory with practice, Congress for the first time, took decision that dogmatism is the main danger inside party; it declared the end of prominence of that theory which is not connected to practice. The later rectification campaign and present anti dogmatic rectification campaign is the step of smashing the prominence of such theory that is not connected to practice. Therefore, it is need of first stage of revolution that is behind the prominence of that comrade. In terms of standard of qualification of present stage, he became disqualified. The next stage of organization and revolution is to solve problems in military case. In this case, comrades able to solve the problems will get prominence. In the next stage, it will be to solve the problems during the time of governing state and accomplishing national democratic revolution. At that time, those comrades will get prominence who are able to solve that. Those who got prominence in previous stage but disqualified in this stage, naturally they will be treated as disqualified and new qualified ones will replace them. In the next, the stage of carrying socialist revolution, socialist construction and the Proletarian Cultural Revolution will come, in which prominence will go to those who are able to carry responsibility in that stage. Therefore, the tasks of stage of revolution and party will determine the standard of qualification of comrades. The qualified ones for each stage will get priority in that stage. If they do not have qualification in the next stage, they will be discarded. It is inviolable material law of revolution and party. This happened in China and rest of the world. This is why it is not difficult to be qualified for one stage of revolution but it is difficult to keep oneself qualified for each and every stage and change himself/herself accordingly. Our comrades should be qualified for the whole life. If we do not find out qualified cadres for different stages of party and revolution and do not appoint in proper places and do not replace those comrades who were qualified for previous stage but disqualified for present stage, then, bureaucracy will enter in organization and hinder the motion and development of organization and the organization will fall in stagnation and die. The combining of theory of practice is needed to policy making and cadre maintenance, and also, it needs to leave on the one hand dogmatism, and on the other, narrow empiricism. So, keeping that comrade’s appointment in policy making level will only mean keeping the possibility of party being influenced by dogmatism, which may result party to be target of left or right deviation, revisionism and opportunism. That comrade is over simple person, the opportunity of which may be taken by bad elements. On the contrary, he should be appointed in such place so we can utilize his theoretical knowledge (one-sided) but that will not influence in policy making of party, bad elements will not be able to utilize him and that does not have security and organizational responsibility. Another reason of giving prominence to him is the inexperience of party. Organization had no idea how to utilize special knowledge. That means, party did not have experience that if a person is not qualified for committee, he should not be taken in committee, but we can appoint qualified one as in-charge to guide the disqualified one in carrying responsibility, and how to utilize the knowledge of those who have special knowledge. Therefore, that comrade got prominence because of the stage of development of party and revolution, and inexperience of organization in appointing and utilizing cadres. We have to utilize the good and strong aspects of that comrade. We are calling upon the comrade that he should realize his qualification, limitations and erroneous aspects and also his ideological basis, and promise to correct; and considering all those, he should carry tasks given by organization and keep his confidence over the organization.